This cozy, romantic and historic "baby grand" hotel with luxurious accommodations is located in Jackson, close to New Hampshire's Kancamagus Highway: arguably New England's most scenic fall foliage drive. Be sure to ask for one of the rooms featuring a gas fireplace and a private indoor whirlpool tub or private balcony hot tub for two. Traveling with kids or looking to leaf peep on the cheap? The Holiday Inn in Salem, New Hampshire, offers affordable room rates in the fall, and kids stay and eat free. The hotel offers an indoor pool and wireless Internet access, and although it's not in a scenic location, it's centrally located within an easy drive of family-friendly fall attractions in New Hampshire and Massachusetts such as America's Stonehenge, the Mega Maze at Davis' Farmland, Walden Pond and Massachusetts' scenic Route 2, the Mohawk Trail. This collection of four inns, plus two lodges and a Lakeshore Cottage, is situated on New Hampshire's largest lake: Lake Winnipesaukee. Mill Falls offers enviable autumn views and a convenient, central location from which to explore the Lakes Region's many scenic attractions. It's a good choice, too, if you're attending the New Hampshire Pumpkin Festival, now held in Laconia. Don't miss the chance to embark on a scenic foliage cruise aboard the M/S Mount Washington. Recognized repeatedly for having one of the best views from an inn in all the world, this classic lodging property overlooks the incomparably picturesque White Mountains, yet it's conveniently located in the heart of North Conway. If you're looking to leaf peep on the cheap, consider one of the inn's rooms with a shared bathroom. Rooms with private bathrooms are available, as well. Don't let the name fool you! The Snowvillage Inn isn't just a winter destination. Leaf peepers love the scenic hiking that awaits right outside the inn's doors, and it's an ideal home base for exploring the White Mountains in the fall. Customize your trip by choosing from nine different fall packages. This upscale Holderness, New Hampshire, inn with its own on-site spa is wonderfully situated overlooking Squam Lake, the filming location for the 1981 movie, On Golden Pond. 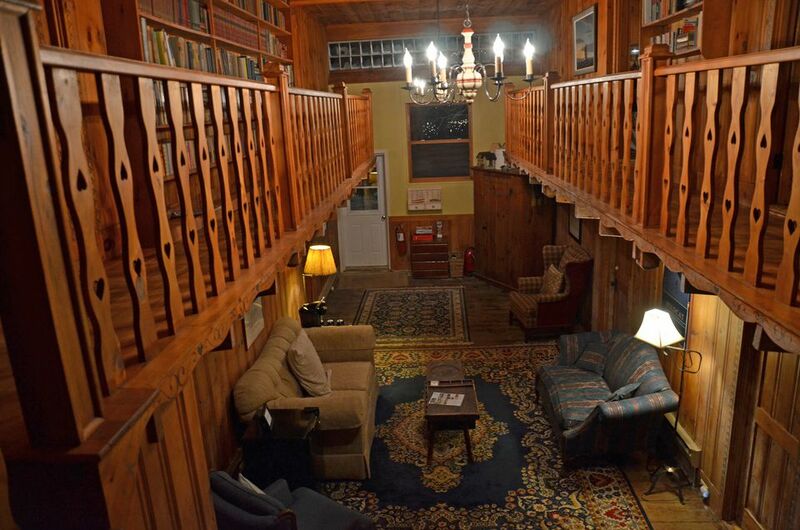 This scenic lodging property in North Conway, New Hampshire, has the charm of a small inn with all of the amenities of a large hotel, including a year-round outdoor pool that is kept at an inviting 92 degrees. I'll bet you didn't imagine you could leaf peep from a swimming pool! Looking for more New England fall foliage travel inspiration? Start with New England Foliage Central, where you'll find all you need to plan a memorable autumn escape. For more ideas throughout the fall season, ​follow Foliage Central on Twitter.